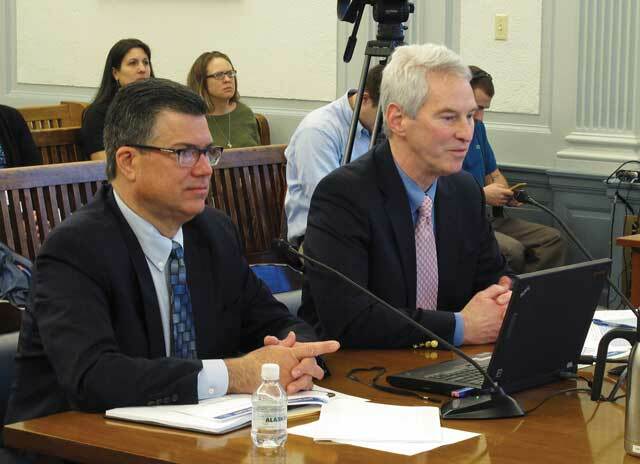 Even small construction projects are often complex in their own ways, but a July 11 legislative hearing emphasized the daunting amount of highly sensitive and technical work that must all be carefully coordinated to successfully thread the $43 billion Alaska LNG Project needle. Held in Anchorage, the joint meeting of the House and Senate Resources committees updated legislators on the progress of the megaproject, which by all accounts would be the largest in the history of the country. Alaska Gasline Development Corp. board of directors Chairman Dave Cruz said the quasi-state group has now secured letters of intent or other memorandums expressing interest in buying LNG from 15 entities. AGDC has announced a handful of those nonbinding agreements since early 2017 signed with some of the world’s largest LNG buyers, but has mostly declined to disclose details, citing commercial sensitivity and the wishes of its counterparties. The notable exception is the November 2017 signing of a joint development agreement, or JDA, with three nationalized Chinese mega corporations, which outlines the prospect of China buying up to 75 percent of the project’s LNG in exchange for financing 75 percent of its cost. The remaining 25 percent of the project’s planned production capacity of 20 million tons per year of LNG would be split among other buyers if a deal with terms similar to the nonbinding JDA is finalized with the Chinese. “I’ve absolutely been amazed at the reception we’ve gotten from the Asian countries. I’m still waiting on a call from (North Korean dictator) Kim Jong Un,” Cruz quipped. East Asia is the key market for Alaska given LNG demand from the region is likely to continue to grow and Alaska’s location is advantageous for selling into Asian — but not European — markets. AGDC Commercial Vice President Lieza Wilcox again stressed that long-term demand for LNG will continue to grow in those markets and overcome the recent supply glut as nations, notably China, move away from coal and nuclear power and towards cleaner and less risky natural gas for power generation. AGDC President Keith Meyer was occupied by a financing meeting with New York investors and was unable to attend the hearing, according to Cruz. On the supply side, detailed gas sale negotiations with BP, ConocoPhillips and ExxonMobil are ongoing, Wilcox said. AGDC and BP made a big announcement May 7 that they had reached a binding agreement on the key terms of gas price and volume the company would sell into the Alaska LNG system, but further points still need to be hashed out. Gas sale negotiations with ConocoPhillips and ExxonMobil are nearing a similar level of detail as talks with BP, according to Wilcox, who also added that the companies might want to work directly on final agreements and bypass a term sheet, which makes for a longer series of talks before successes are announced. Under the tolling structure AGDC is proposing, the corporation would buy the gas shortly before it enters the North Slope gas treatment plant. AGDC would then sell the LNG at the marine terminal in Nikiski. The final LNG sale price would include the project’s revenue-generating toll that needs to cover all of the project’s costs. Wilcox said the project could afford a toll of about $6 per thousand cubic feet, or mcf, of gas and remain competitive in global markets. AGDC officials also mentioned feedstock gas prices from the producers would likely be in the $1-$2 per mcf range after stating for months that the producers would have to sell gas into the project at about $1 per mcf or less to make price-competitive LNG. AGDC’s Meyer has said the producers should generally be willing to accept a lower price for their shares of North Slope gas than previously expected because they no longer have to invest in the project infrastructure, unless they choose to. However, reaching agreement on commercial terms for gas sales with all three major producers — as important and momentous as it would be — is only part of getting upstream Alaska LNG issues resolved for a successful project, Department of Natural Resources leaders described at the hearing. For starters, administration officials and then legislators must decide if they want the state to get its 12.5 percent royalty portion of North Slope gas reserves in-kind or in-value. Natural Resources Commissioner Andy Mack said at this point the priority for the state is royalty in-kind, or RIK, but that could change. Royalty in-kind refers to the state taking its share as natural gas, instead of receiving payments from the producers for the market value of the resource, which is what would happen if the state took its royalty in-value, or RIV. The state regularly takes its share of royalty oil in-kind and sells it to local refineries in an effort to maximize the in-state economic benefits of oil production. Department officials are also in talks with the producers to get a sense of their preferences regarding royalty gas issues. Those issues include: the RIK or RIV, decision; details around whether the producers will pay gas production taxes in equivalent value volumes of gas, known as tax-as-gas, or TAG; the interplay of gas production from the Prudhoe Bay and Point Thomson fields; and how carbon dioxide disposal impacts other upstream matters. The 35 trillion cubic feet of North Slope gas intended to feed the Alaska LNG Project is about 10 percent carbon dioxide, which must be stripped out of the gas and re-injected underground. Deputy DNR Commissioner Mark Wiggin said the department has a draft RIK-gas sales term sheet that is being discussed with AGDC officials. If the state makes an RIK selection, AGDC will buy the state’s royalty gas to use it in the project, Wiggin said. He also noted that valuing production is a challenge, which makes reaching acceptable RIV calculations all the more complex. “That is not necessarily, by any means, an easy or simplistic path to go down,” Wiggin commented. Additionally, the Prudhoe and Point Thomson lease agreements currently allow the state to switch between RIK and RIV every six months. Rather understandably, the producers would prefer the state to pick one for the duration of the project, which could necessitate amending the leases, he said. Mack also said that he anticipates further discussions on how to align what is happening in the project with the 2012 Point Thomson Settlement Agreement, which specified how the high-pressure gas field would originally be developed and expanded depending on whether a large natural gas project moved forward. ExxonMobil operates the Point Thomson field. While DNR is working on the litany of technical resource management issues for the project, Department of Revenue officials said they are busy preparing recommendations for state investment in Alaska LNG based on numerous possible scenarios. Deputy Revenue Commissioner Mike Barnhill said the department’s investment analyses is based on the high-level assumption that the state would fund about $11 billion, or 25 percent, of Alaska LNG’s overall $43 billion estimated cost. From there, it needs to be determined what portion of that $11 billion investment would be direct equity injections and how much would be raised through debt. AGDC’s Meyer has long said he envisions the project being funded through roughly 75 percent debt and 25 percent equity investment. The project’s contracts and other financial arrangements will be structured to allow debt to be “non-recourse,” according to AGDC leaders, meaning the loans would be underwritten by LNG sale contracts. In that scenario, if LNG buyers fall short on their payments, in-turn shorting AGDC’s revenue stream and ability to service its debt, the banks would seek repayment from the end buyers and not the state corporation. Barnhill commented that the risks inherent in such a large project are not necessarily bad. “Ultimately, you’re trying to answer the question: Is the projected return commensurate with the expected risks? Are you being compensated for the risk? Now, we want risk in an investment context. We want to be commensurately compensated for that risk,” he said. Wilcox said AGDC doesn’t expect there to be any risk to the stat in the gas sale agreements with the producers as the wholesale gas price would be passed on to LNG customers. Maria Tsu, Revenue’s gasline financing specialist and a former investment director with the Alaska Permanent Fund Corp., said the department is modeling investment scenarios and risks based on likely commercial terms AGDC can secure and then looking at potential disruptions to those assumptions. For example, the department is analyzing how construction delays could impact the project’s economics over its expected initial life of 25 years. She noted that de-risking the project can make investors — the state or others — more comfortable with it but at the same time likely means lower returns. “I think there will need to be state participation in order for the project to move forward and prevent the state’s equity interest from being diluted and for the state to not lose control it will be important for the state to provide both possibly development capital as well as construction capital to the project,” Tsu said. Investing when construction risks are largely settled would likely lead to lower, but stable, infrastructure-type returns in the 8 percent to 10 percent range, according to AGDC and Revenue officials. Meyer has stressed that investors willing to sacrifice high returns in exchange for reliability would supply the bulk of the project’s equity investments. Sen. Bert Stedman, R-Sitka, who manages an investment firm, emphasized that cost overruns of up to 20 percent — beyond the $9 billion of contingency costs built into the $43 billion Alaska LNG estimate — are often considered a relative success for megaprojects. He urged Revenue officials to test the impacts of overruns in the $20 billion to $30 billion range, which he said are not out of the realm of possibility for the project that had an original estimated cost range of $45 billion to $65 billion. He further requested the department analyze the financials of specifically Arctic infrastructure developments given the inherent challenges of building in that environment. “I don’t mind betting the cow but I won’t bet the farm,” Stedman said of the state’s role in financing Alaska LNG.